Three months after the the biggest off-shore oil accident in history, it’s business as usual in Parliament, with more subsidies given for dangerous deepwater drilling in UK waters. Now, if you believed that the outcome of the free market was always optimal and good, you’d wonder what was going on. Surely if it’s disproportionately expensive to go for oil in certain places, then it should be left there until either advances in technology made exploitation cheaper, or the price rises sufficiently to make it affordable. The link http://www.parliament.uk/ is currently redirecting to http://www.parliament.uk/templates/errorpages/500.html?aspxerrorpath=/Templates/Main/Pages/Home.aspx. Someone will be staying up late trying to get this sorted out. The deep links, such as http://www.publications.parliament.uk/pa/cm201011/cmgeneral/deleg3/100720/100720s01.htm to a committee debate I am in the process of ranting about, still work. Following this blogpost, here is my reply to the response. The preliminary hearing is set for 13 August, I believe. What a lot of work. 1. This Reply is served in accordance with rule 24 of the Tribunal Procedure (First-tier Tribunal)(General Regulatory Chamber) Rules 2009. 2. My request was for all progress reports produced by the Democracy Live team, including any that were filed by the contractors Autonomy and Blinkx in the 18 months leading up to the launch of the Democracy Live service. 3. In a conversation with the ICO I clarified my request to focus on the technical progress reports produced by the contractors, which I believed came under the terms of the Freedom of Information Act. This was a reasonable move because, according to the guidelines, if some of the requested information is exempt, the non-exempt information should still be disclosed. 4. The Democracy Live service was launched on 2 November 2009. In particular, I am referring to its repository of archived video content from at least 8 debating chambers which has been filtered through Blinkx and Autonomy speech-to-text technology in order to enable a text-based search feature. (a) Is the Democracy Live service (video archive, speech-to-text and search), considered in its own right, journalism? (b) Is this video and searchable content held to any significant extent for the purpose of journalism within the terms of the High Court Judgement? Is the Democracy Live service journalism? 6. According to Decision Notice FS50284450, the BBC argued that the technical progress reports which relate to the development of the site are held for the purpose of journalism, and that web content developers require private journalistic space in which to gather, analyse, weigh and editorialise information in order to determine the most effective way to provide this coverage. 7. It is not the case that all web content provided by the BBC is journalism, art or literature. For example notices of transmission times, and google-generated pages of search results of their content are not the product of journalism, art or literature. In other words, in common with TheyWorkForYou.com, there is no selectivity applied to the source material. Any failure detect the word “pipsqueak” spoken by Tom Watson MP in the House of Commons on 7 July 2010 can be assumed to be purely a failure of the technical implementation, and not the consequence of any journalistic editorial selection by the BBC. 9. I have submitted my appeal to this Tribunal in the hope of clarifying the issue that there are no journalistic processes occurring between the raw source material (video feeds from the debating chambers), and the Democracy Live service which is accessible to the public. Is the Democracy Live service held for the purpose of journalism? 10. The response by the ICO to my appeal downplayed the points provided to them by the BBC indicating that Democracy Live was equivalent to editorial content. Instead, the ICO argued that the meaning of “journalism” was wider than simply editorial selection, because it involved collecting or gathering, writing and verifying of materials for publication, and that the involvement of editorial staff on the steering group which received the technical progress reports from the contractors was relevant. 11. The Democracy Live service could undoubtedly be useful as a means of gathering materials for the purpose of journalism. However, because the service appears to be fully exposed to the public on the website — at least to an equivalent extent that BBC journalists have access to it — the journalism derogation cannot be stretched to protect it from FOI. 12. The Democracy Live service, to the public and to BBC journalists, could easily be sold off and provided as-is by a third party without any change of procedure. Disclosing information about it would not disclose anything about journalists’ private gathering, writing and verifying of materials for publication, because these materials are fully published in the form of the service. That is where the jurisdiction of the journalist ends. 13. It is true that BBC journalists and editorial staff may be heavy users of the Democracy Live service. As such it would be reasonable for the team to consult them at any stage of the project in order to ensure that it was a success. But this is equivalent to an authority consulting and following the advice of journalists as to where and when to hold a major press conference so that more of them turned up. 14. I have not been able to address any of the exemptions that are likely to be applied if the requested information comes under the Freedom of Information Act. If disclosure is considered exempt under Section 43 (Commercial interests) then it is subject to a public interest test. 15. The Democracy Live service, as advertised, clearly has a displacement effect on the activities of TheyWorkForYou.com, in that it provides a new competing website where viewers can search the speeches made by MPs in the House of Commons. 16. There are issues with the reliability of the Democracy Live technology, in that it is less capable than TheyWorkForYou.com at delivering accurate results for searches of speeches in the recent past, or anything preceding September 2009. “Our search is powered by a speech-to-text system built by two companies called Blinkx and Autonomy which create transcriptions of the words spoken in the video. Generally speaking, the industry standard for accuracy in speech-to-text systems is reckoned to be about 80%. In Democracy Live tests, we’ve seen slightly higher than that. We’ve taken account of different accents across the UK but the system might still be a bit confused by some words. Have a look at the explanation of how the site works for more about search and other questions you may have. 18. Beyond the above statement, there is no other information about the suitability or reliability of the service provided, or any recommendation to viewers who have experienced inadequate results to try TheyWorkForYou.com if they are searching UK Parliamentary debates. 19. Democracy Live does cover the European Parliament and Select Committees, which TheyWorkForYou.com does not. Given a fraction of the resources that have been lavished on Democracy Live, TheyWorkForYou.com (which is an open source project run by a charity), could have easily extended its coverage (based on webscraping and parsing technology) to these other bodies. However, this activity has been delayed and is unlikely to happen, owing to the displacement effect of the government resourced Democracy Live project. 20. Accordingly, I believe it is in the public interest for the BBC to be compelled to disclose requested information about the technology and development of this non-journalistic web-service so that viewers can be informed about its cost, nature and reliability. 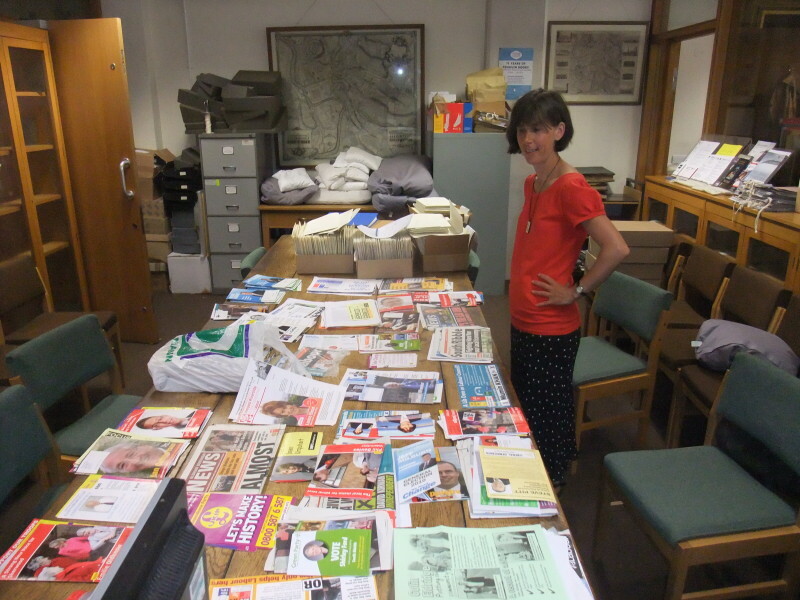 Last Monday morning (28 June) I dropped by the Bristol University library (special collections) to make a deposit of election leaflets. The librarian gave up making notes pretty rapidly when she realized I was going to be there all morning laying out my haul of leaflets like some mad door-to-door decorative vacuum cleaner bag salesman that you just can’t get rid of once they’re in your house. This is only half the haul. There’s another bag in the middle of the table. On the back you see the boxes of brown paper envelopes the librarian has to file everything into, according to constituency, where they will be safe from prying eyes. it was never my intention to collect so many leaflets. But we put the word out on TheStraightChoice.org website that if you didn’t have a scanner of your own, you could mail them to me and I’d do it. The job took many sleepless nights to keep up with in the days before and after the election.